This Ultimate Muffin recipe is THE master muffin base that is perfectly flavorful, tender, and moist. The flavor and add-in options are limitless! Download my free Ultimate Muffin Guide here! 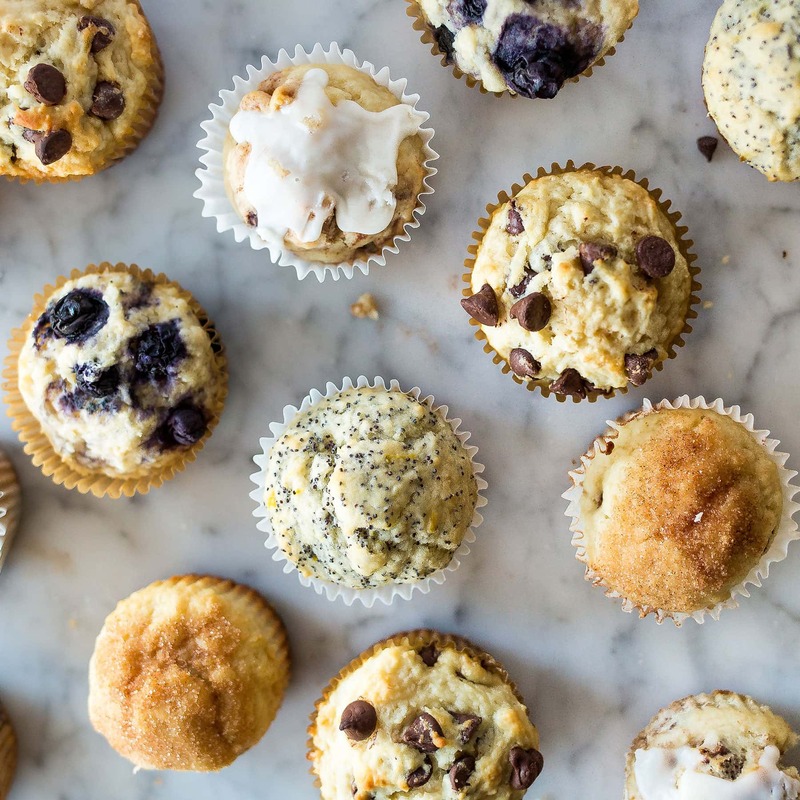 Taste: The muffins themselves are sweet, but not too sweet, and surprisingly flavorful thanks to the buttermilk and butter. Of course, they’ll take on the flavor of whatever you add to them! Texture: Soft, tender, and moist. Perfect! Ease: These babies are so easy, anyone could make them. Whatever you do, just don’t overmix the batter. Appearance: A plate of these on your breakfast table is bound to make anyone a morning person, at least for a few minutes. Pros: This is the master basic ultimate muffin recipe that you can turn to time and time again and customize with whatever you have on hand, or whatever you’re craving! Would I make this again? Oh yes. Over and over. A few years ago I posted my Ultimate Guide to Muffins where I made eight (!) experimental batches of muffins. I did it to figure out what exactly makes them moist, crumbly, tall, flat, tender, or tough. Like I’ve done with my Ultimate Chocolate Chip Cookie and Ultimate Brownie recipes, I knew I had to take the experimenting insights to create the Ultimate Muffins! So, here it is!! This is my version of the *ultimate* muffin. They’re tender, moist, and fluffy. If you want to know the whys behind the recipe, such as why I start baking at a hotter temperature or why I love using buttermilk, check out my Ultimate Muffin PDF guide. Otherwise, just relish in the fact that if you have similar muffin preferences to me, you’ve finally found the muffin recipe! The one you can turn to over and over and know it’ll work. I love this recipe because you can literally add WHATEVER you want to it. The flavor and add-in options are endless. You can see a few of them in the photos. I’ve included a bunch of mix in and flavor options in the actual recipe below to give you some measurements and ideas, but feel free to go crazy! That Ultimate Muffin PDF guide. I mentioned has even more flavor options, as well as pictures and insights into the science of muffin baking. I really hope you enjoy this recipe as much as we do. I think you’re going to love it. I know I just love having the ultimate version of any beloved recipe treat, it makes baking that much more fun when you know you’ll be successful in the kitchen. I put a lot of time and energy into creating all my recipes, but especially on these Ultimate Guides and ultimate recipes. I believe baking doesn’t have to be intimidating or complicated and learning how it all works (and why it doesn’t work sometimes) is the key to having baking successes instead of fails. I’ve done all the fails for you! I’ve turned everything I learned from culinary school, writing a cookbook, and doing endless kitchen experiments into recipe wins for you. 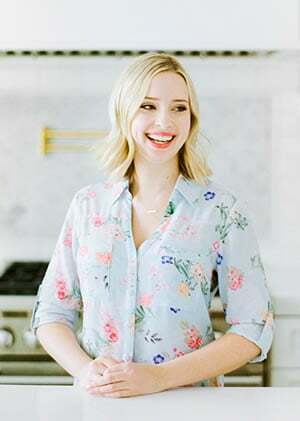 If you’re interested in learning more about the science of baking and getting all of my best baking secrets in one place, I think you’ll love The Magic of Baking. It’s my new online baking class and the feedback I’ve gotten from the first students has been incredible! Check it out here. Preheat the oven to 450°F. Line a standard muffin tin with paper liners or coat with nonstick cooking spray (or both). In a large bowl combine the flour, sugar, salt, and baking powder. In a liquid measuring cup beat together the buttermilk, butter, egg, and vanilla. Pour into the dry ingredients and stir JUST until combined, do not overmix. Divide evenly among the muffin tin cups. Bake for 5 minutes, then reduce the temperature to 400°F (don’t forget this!!). Continue baking until golden brown and a toothpick inserted in the center comes out clean, about another 12 minutes. Add about 1 cup chocolate chips, nuts, dried fruit, candy, etc. If using fruit, add in with the dry ingredients to make sure the fruit stays evenly distributed and doesn’t sink to the bottom. Add in with the wet ingredients. Add the poppy seeds with the dry ingredients and the lemon zest with the wet ingredients. I love your guides and posts – cookies and the muffins have been amazing and so informative!! These muffins definitely look like the “ultimate” choice! They remind me of Starbucks muffins – which are the best in my book! How about a guide to “scaling recipes”? There are many times we want to halve a recipe or double it for occasions and the baking time does not undergo the same change of being multiplied by a whole number. Consequently, the baked goodies do not turn out the way they’re supposed to. Also, when one tries to adapt a cake recipe for cupcakes or vice-versa, there’s a chance of things going terribly wrong. Would love it if your next guide shed light on the same. Could you pleeease do a recipe for macarons? Please? But not the ones that take 3 hours – could you create a simpler recipe? Thanks!! Made these today and they are AMAZING!!!! Tessa is a god, The ultimate guides series is so interesting. Highly recommend. These were a roaring success. Will be making again! 10/10. Hi these sound great and I agree it is disheartening when you bake and it just does not turn out right. Question – with regards to the buttermilk do you use store bought or make your own and if so did you find a difference in the texture/outcome? My home made buttermilk tends to be thinner than store bought (though that could be my patience level). I do love you posts and reading all about the processes. Hi! I am new to your site and I am a muffin lover I must admit! I just happen to made your muffin recipe as you posted it and I wanted to check if the batter is super sticky and thick or I just did something wrong. To half of the recipe I added blueberries and to the other half I added choc chips. I followed your instructions to not overmix them. The outcome is similar to yours they are delicious with there is something going on with the texture or maybe is this recipe. Amazing recipe by the way and I have learnt a lot from your explanations and your blog in general. Happy Baking!! Hi! Just tried making these – they’re baking in the oven as I speak! Just like Claudia, I found that the batter was extremely thick and sticky – was it something I did wrong, or is it meant to be like that? These are exactly the proportions I look for when searching for new muffin recipes. And always use about 1/2 cup sugar for 12 muffin yield even if it calls for a cup. How would you go about adapting this recipe to add oats to it? I would think some flour would have to be removed but wasn’t sure what the ratio was. I’m really wanting to try this recipe for blueberry muffins but have some of the same questions as others have asked. Has anyone received a reply? Is the batter supposed to be thick? Also, does anyone know how to make bakery style crumbly topping? In my (admittedly limited) experience, muffin batter tends to be much thicker than cake batter. I also found that the liquid ingredients, once combined, came to 1 1/3 cups, which is great, because I wanted to make 6 blueberry and 6 choc chip muffins. The dry ingredients were easy to do in two separate bowls, and then I just added 2/3 c. of the wet ingredients (once I had combined them) into each bowl. The muffins just came out of the oven, and I really can’t wait to try them…. even though I have to because they are too hot. Hi…just got your mufin recipe from a post in Facebook, think i’m going to try my hand at it…the question is : is there a substitute for buttermilk ?????? i don’t know what that is and don’t think they sell it here in Brazil, never saw…..is it like cream ? Any time I make muffins, this is the recipe I use. I had some leftover fresh cranberries from Christmas, so today I made cranberry orange muffins (orange zest and some of the juice). I made a topping with brown and white sugars and pecans, mixed in my food processor. Yummy! Awesome, Julia! Hope the kids enjoy it. would you be able to advise how to add oats to the recipe? I have been looking forward to making this recipe since I discovered it last week. I have finally made them this morning and they are delicious. Moist, light and fluffy. Just beautiful. My recipe came out much darker than the muffins pictured. I am not sure what If I did something wrong but the taste and texture is there with a bit of a extra crisp because of the darker finish I assume. I will definitely be making them again. I can’t wait for my family to come to try them! Hi, Ali! I’m thinking your dark muffins could be one of two things. Either your oven runs hot, and in that case I’d purchase an oven thermometer to gauge the correct temperature and adjust as needed. And maybe next time reduce the baking time since everyone’s ovens bake differently. OR, you may have used a dark nonstick muffin tin, which increases browning. I’d suggest getting a lighter color tin. Hope that helps! Thanks so much for the muffin base recipe. My friends and I are wondering how we compensate in time for cooking the large muffins. I’m assuming these muffins are cupcake tin size. Thanks again for your good help. Great question, Barb! After baking for 5 minutes at 450°, reduce the temperature to 400°F (don’t forget this!!) and bake for about another 15-17 minutes. Check for the visual cues, golden brown and a toothpick inserted in the center comes out clean. Hi, great recipe, thanks for the post with pictures. My question is do you find with muffins its best to melt the butter than let it cool before adding ? Also do you usually use regular flour not cake flour with muffins ? I let it cool just enough that it won’t risk scrambling bits of the egg. Also, I never use cake flour with muffins. I find they end up being a bit too dry and crumbly. Hi! I’m from Brazil and I really want to make this recipe. I’m not quit sure though if we use the same measuring cups. Could you tell me the capacity of your cup? And could you please give me the amount of both sugars in grams? We made these tonight and added lemon and poppy seeds. Excellent! My 16 yo son is in a culinary focus program and one of his “wanted to knows” was a solid muffin base. Nailed it! Thanks! Tessa, I know you said to use a light pan but I have just invested in two really nice quality dark pans because my intention was to make muffins for my college freshman daughter and her suite mates. I did that yesterday with other recipes and they were dry. I am looking to you for advice or else I am giving up baking! Is it possible to use my nice new pans, as I hate to add another costly failure to my list. PS, I consider myself a seasoned cook, so it stinks that I can’t make a homemade muffin! Hi Tessa, Have you used Bake-and-Serve paper cups to bake muffins or cupcakes? Ive used them a couple of times, just placed standing on a baking sheet, but somehow felt the texture of the cupcakes were not the same as when using a muffin tin with paper liners. Are we supposed to place the cups in the muffin tin and bake? They took longer to bake. It there a way to make your own buttermilk for this recipe? Like adding vinegar to milk and letting it sit for a little while? If so please let me know whar it portions to do. Do you make youe own buttermilk or have you made your own buttermilk from scratch with vinegar and milk? I would love to be able to make my own for this recipe because I don’t normally use buttermilk and the stores where I live don’t sell buttermilk in small quantities. Hi Tessa, great recipe, thanks a lot! What do you think about kefir as substitute of buttermilk in this recipe? I’ve heard that makes a great substitute! I’ve never tried myself. I am craving theses muffins and really aprreciate how all baking lovers are brought together. We are all kind of a community which keeps us united and unique. My question is, are there any alternatives to frosting rather than using butter, because where i live, butter is expenisve for it’s size, therefore, my family try not to get too much of it. However, the frosting of a cake/muffin is the best part. I made these muffins yesterday. When I combined the melted butter and buttermilk and whisked them with the egg and vanilla, it looked like the butter solidified. I thought I had let it cool as directed but the whisk ended up getting caked up with what looked like a buttery/buttermilky mess. Was the buttermilk too cold? Was the melted butter not cooled enough? Then when I took them out of the oven they were not very golden brown and they stuck ferociously to the liner. Help! Another easy to follow recipe from Tessa that has great results. My blueberry muffins was fluffy and delicious. Thank you for all the work you do on these recipes. am i able to freeze this recipe? if so would you freeze it before or after baking?